This page is about the German twin-engine fighter Me 410. For other uses, see Me 410 (Family). The Me 410 A-1 is a Rank III German twin-engine fighter with a battle rating of 3.3 (AB) and 3.7 (RB/SB). It was in the game since the start of the Open Beta Test prior to Update 1.27. 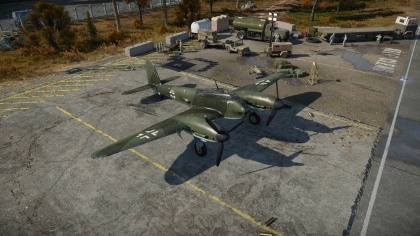 The Me 410 A-1 is the first variant unlocked of the Me 410 lineup of planes, succeeding the Do 217 fighter variants. Compared to Do 217, the Me 410 boasts significantly better flight performance in virtually all aspects and performs much more like an improved BF 110 C-4. However, in the large spectrum of things, this doesn't really say a lot as the Me-410 gets pitted against even faster, more nimble and better armed single-engine fighters than it's predecessors. Perhaps even more grievous of a pitfall, it's armament of 2x 7.92mm MG15 machine guns and 2x 20mm MG 151 cannons hardly outgun conventional fighters. A small but nonetheless noticeable plus is that defensive armament has very good coverage of the entire rear of the aircraft besides the immediate area behind the tail boom. The Me 410 A-1, like the Do 217 and the BF 110 C-4, is completely committed to Boom and zoom tactics, and just like the predecessors, is useless at absolutely everything else. 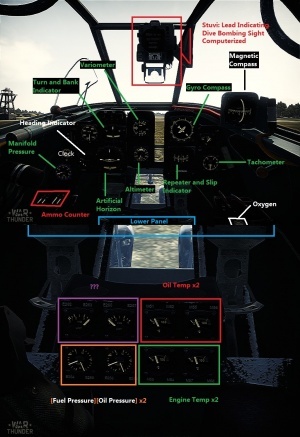 Trying to retain energy and knowing where your friends and enemies are is key to surviving in the aircraft. This also means, just like with the previous heavy fighters, that you should never commit to following a certain enemy. If an enemy is starting to turn off to the point where you need to use elevators to assist you in a turn, you will be burning far too much energy and make yourself easy prey for more nimble fighters. Larger ammo capacity than conventional fighters. Significantly more manoeuvrable than the Do 217 fighters. Capable of mounting a decent amount of bombs (for a fighter) by default in the internal bomb bay. Defensive armament cannot shoot directly behind the aircraft, leaving a very critical blindspot in the coverage. A sitting duck if caught in a low energy state. Compresses easily at high speeds. Wings rip easily at high speeds in RB/SB. The Me 410 was the development of the Me 210. Which had many aerodynamic flaws that resulted in Me 210 squadrons being decimated by more nimble Hawker Typhoons. The Me 410 was re-designated so it is associated with the Me 210. This included a lengthened fuselage, more powerful Daimler-Benz DB603A engines, and larger wing surface area. Most importantly, the installation of automatic slats that greatly improves handling characteristics. 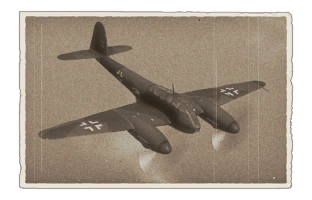 Early versions of the Me 410 were designed as fast night and day bombers. But quickly fell prey to better British night fighters. In the role of a heavy fighter, the Me 410 was used to attack US day-bomber combat box formations. Equipped with 50mm BK cannons or 210mm Werfer-Granate rocket tubes. These modifications made the Me 410 rather clumsy and manoeuvrable. This made easy targets to the bomber's escorts, fast and agile Spitfires or P-51 Mustangs. The Me 410 often worked in co-operation with Bf-110s. In the closing stages of World War Two, many Me 410s were used as homeland defence or tactical reconnaissance.